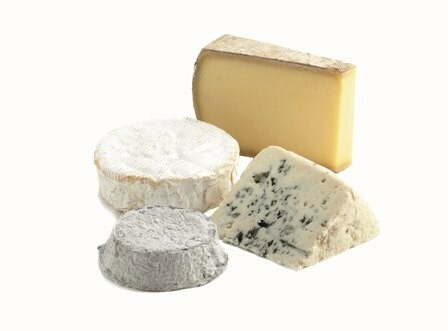 Four of the greatest cheeses offered by a country famous for its fine cheese making tradition. A fabulous French cheese collection featuring a variety of different textures of cheese made using different types of milk. Comte PDO Unpasteurised Cows' Milk, Traditional. Alongside Beaufort, this cheese is the richest and most popular hard cheese in France. It is traditionally produced in the mountains of Jura where farmers bring their milk down to local cooperatives managed by villagers. It takes 530 litres of milk, equivalent to the daily production of 30 cows, to make one Comte cheese weighing 45kg. The surface of the rind has a moist, cool ochre coloured rind that is regularly wiped with brine and the cheese inside is firm and supple and melts in the mouth to leave a sweet taste with a subtle nutty tang. Selles Sur Cher PDO Unpasteurised Goats' Milk, Traditional. Selles Sur Cher has been made for centuries by farmers for their families consumption. The recipe has been passed from generation to generation as a useful way of using their goats' milk. Produced in an area south of Blois in the Loire Valley, Selles Sur Cher is a small disc of cheese with a very fine coating of ash on which grows a fine blue/white mould. The interior of the cheese is fine textured, succulent and velvety. The smell is of walnuts. The lingering flavour is also nutty, slightly sour and salty with a hint of sweetness. Roquefort PDO Unpasteurised Sheeps' Milk, Traditional. Perhaps the most famous of French blue cheeses, made from the raw milk of Lacaune sheep and matured in the Cambalou caves below the village of Roquefort - sur - Soulzon. The cheese can be made in many regions of Southern France but if it is not matured in the Cambalou caves it is not covered by its AOC protection and is not truly Roquefort. A good Roquefort will have a clean, powerful flavour balanced with strong salt and a distinct sweetness imparted from the sheeps' milk.